Born in 1929 in New York City, Milton Glaser is a groundbreaking American graphic designer and illustrator. He is one of the most internationally renowned, celebrated, and influential designers of our time. In 2009, he was the first graphic designer to receive the National Medal of Arts, which was awarded by President Barack Obama. He began at the High School of Music and Art in New York and continued at the Academy of Fine Arts in Bologna. Later in life, he lectured and taught others at the Cooper Union and the School of Visual Arts in New York. He launched New York Magazine with Clay Felker in 1968 and founded two successful studios, which produced some renowned works. 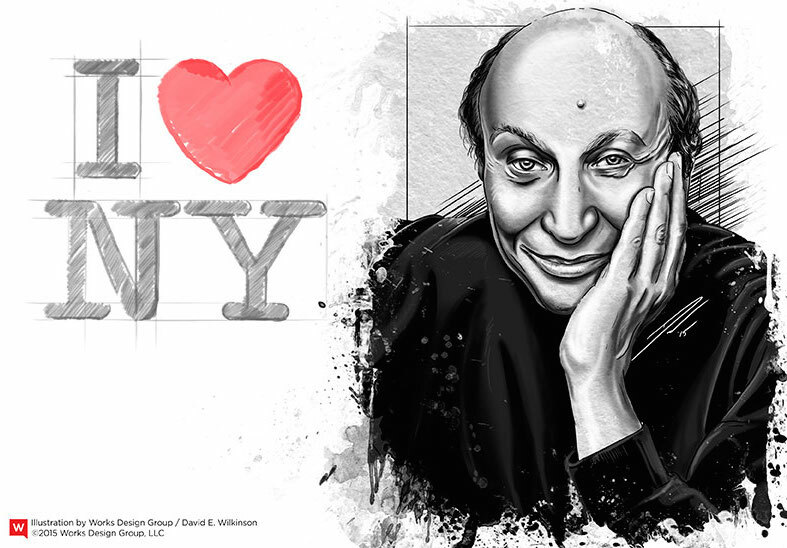 Many written works and even a documentary film, “To Inform and Delight: The World of Milton Glaser”, have studied his important work. His work is also celebrated regularly at MoMA. While he created a number of important works and iconic logos, his most celebrated is the “I [Heart] NY” logo. This logo has become a New York trademark and can be found on every street corner. It is also a tourist favorite and is one of the most enduring and iconic designs in the modern era. He focused on more than one type of design, working on everything from book covers and more than 500 posters to environmental and interior design. He is also highly celebrated for his work in 1966 designing an iconic Bob Dylan poster and album cover, featuring Bob Dylan with colorful kaleidoscope hair. Glaser believes that “color is so intuitive”, which is widely apparent in most of his colorful, exotic, illustrative works. Glaser believes that “To design is to communicate clearly by whatever means you can control or master.” He believes that to be a good designer, you need to begin by being a good citizen. Each design can bend culture, affect the community and environment, and can even affect a person’s day. He goes into each project with care for the general public to ensure the design benefits the greater good. At 85 years old, Glaser is still going strong. He currently works in a small studio in Manhattan, and in 2014, he launched a campaign to raise awareness of climate change. He leaves these important words with all designers and aspiring designers alike: “You must embrace failure.” Continuing to learn and grow from his mistakes has been part of Glaser’s strategy for years.